I started Tool Time Tuesdays on March 10th 2009, thinking I would do a few Tuesdays and then run out of ideas...who knew it would be a year later. As a thank you to all of you who have been there each week encouraging me along the way, I want to have a give away with some of the items from the TTT posts. 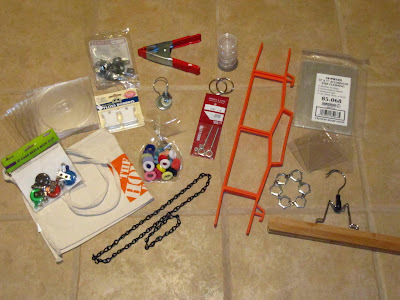 Below is a picture of some of the things that I purchased duplicates of...apron, retractable scissor clips, bag of pipe handles, package of 10 aluminum sheets for the dry erase board, eye bolts for the sewing necklace, bobbin cards for quilt row markers, hair elastics for bobbins, washers to make circles for applique and much more. I have to run out this week and pick up a few more items to add to the give away...so stay tuned! I'm also including 2 fat quarters from Moda's French General...Rouenneries to do the projects that require fabric, like the trim on the apron. 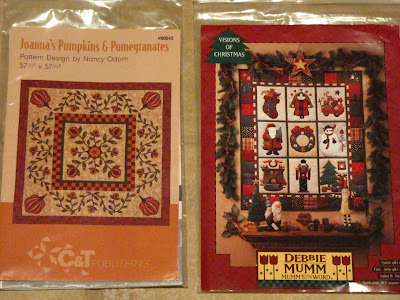 I was organizing some patterns this weekend and found these that I have had for a long time. They are brand new and need to go to a good home, so they will be included in the give away too. if you do a post about this give away on your blog, leave another comment letting me know for a third chance. I have a lot of friends who stop by each Tuesday who don't have blogs, so just email or tell a friend about the give away and that will take the place of doing a blog post. Don't forget to do another comment though. If you would like 3 chances, you need to leave 3 different comments. This makes it so easy to keep track of everyone's entries if they are all separate. Thanks again for being with me through all those Tuesdays and I hope we can have many more together!! I'll pick the winner next Sunday March 21st. Karen, what fun! And it looks like I'm the first comment! Yea!!! Of course I'm a follower! Everyone who's anyone should be! Maybe I'm the lucky number 2 commenter? Thanks so much for the chance to win! I already follow from my blogroll, but officially became a follower, too! Karen I have really enjoyed your TTT posts and can't believe that it has been a year. I won a heart table runner from one of your giveaways last year, well, I am proud to say I have finally finished quilting it and a little embarrassed that it took me so long. I will post a picture of it on my blog soon. I just have a little more binding to put on. I wish I was better at free motion quilting though...I start a class this week. Thanks so much for your generosity! Thank you Karen, for such a wonderful opportunity and for all the fun and great ideas you share. I have been following your blog for more than I year now and have enjoyed every blog post you've done! And I've been a follower, yay!! Hmmm, I usually don't enter give aways but that fabric is beautiful. So please enter me. By the way I'm a follower! It's already one year? Feels just like a few months back that it all started. I don't do all but I just love out of simple things can be made to make our life as a quilter easier. Oh boy Karen, how fun! A whole year of fabulous Tuesday tips! Thanks so much for sharing them. That French General fabric is so nice...a friend picked out some from that very same line for me to make her a purse! What a surprise it would be to add in two other prints from the same line! Wow, it has been a year!!! Amazing what one can do in a year!! I am definitely a follower!! Look for my post on my left side bar....and what a wonderful giveaway!! And I shared info on your giveaway at Hooked On Needles too! Silly of me, because now I'll have less of a chance to win! But I like to share good things! I love your blog and all the cool TTT ideas. I can't wait to check in every Tuesday to see what you have come up with next. I just found your Blog recently and I love it. What fun creative ideas. Yes, Yes, include me on the give a way... I don't know how this works, I want to be a follower, but I am still trying to figure out how to do that. I love TTT! Ever since I found your blog and the wonderful tutorial for a design wall I have been enjoying reading your blog. What a great way to celabrate one year! I am also your follower Karen! I have been enjoying reading your blog ever since I found the wonderful tutorial for a Design wall! Great give away!! LOVE IT!! Please throw my name into the TTT giveaway hat!! Thanks for the chance to win! Of COURSE I'm a follower!! You make my Tuesday!! I just wrote about you in my tomorrow's posting!! Check tomorrow morning (mar. 15). Thanks again!! Wish me luck!! You always have such clever ideas that are SO helpful! I'd love to win some of your supplies! Wow Karen what a wonderful blog. I love your sewing room. This is such a great idea and different so please enter me in your drawing. I can assure you I will be back. I've been following and blogging alot because of you! Wow a year already? You have shared so many awesome ideas and I have used many of them. Thanks for making my sewing life even better. And I am definitely a faithful follower. Count me in, 'cuz if I win that stuff, I can make things like you do and impress my friends by how clever YOU are!!! LOL Congrats on one year of TTT.....can you make it for two years of weekly posts for TTT? And....you know I'm a follower! Wow, nice giveaway! You know how much I love your TTT. They are my favs! Hey, Karen, I feel silly posting twice in a row but as you know I am a follower, 'cause I love TTT! :D I'll post on my blog about your giveaway too. Hi Karen, what a great give away. I love TTT and find it amazing what ideas you come up with. I am also a follower and have been for some time. Here comes number 3 entry...posted on my blog..included the photos too. Great give away stuff! Yes, I've been a follower now quite a while. love all your tutorials and ideas. Happy one year of TTT!! The year fly by so quickly.I love your ideas,Thank you for sharing many fun ideas. It was a great year. I loved to see your great ideas and to try some of them.Thanks so much! I am already a follower. Thanks so much for this give away! I knoww, I have a very small chance, but the things you give away are so cute I have to try. I know,that know is with one 'w'. :) Exercuse me! Love TTT!! My favorite all time TTT was the Travel sewing station!! I use mine DAILY! Congratuations on one year of TTTs; here's to many more years of brilliant ideas! Fun giveaway! I LOVE TTT and look forward to your clever ideas every week. And I am a follower!! Karen, I'd love to be in the running for your TTT giveaway! Thanks for your year of sharing tips! I am now a follower, I've been checking in on you everyday since I found you. You have some really great ideas! Love the idea of the giveaway and would love to win it. I have been a follower for a long time and love all your ideas. Please enter me in your fun giveaway. I'm a follower of your wonderful blog and love your TTT ideas! I have added you giveaway to my sidebar. Love all your gizmos. I'm not a follower, but I have you on my bloglist so I can see every time you make a new post. Thanks for sharing.I'd love to win something, lol. I have been enjoying your tool time posts for a long time. I hope you draw my name because If love to win those great prizes. We now i'm also follower althought you are in my list of the favourite blogs. Wow congrats on 1 year of TTT. Thanks for the chance to win your great giveaway! I am a follower that's 2 entries yeah! I just posted your giveaway on my blog 3 entries hip hip hooray! Thanks for a great giveaway to go with the great TTT! I am so glad I found your blog, I just love TTT. Happy blogiversary! I follow your blog through Bloglines instead of being a Follower. I like your Tool Time Tips. They are always interesting. Just more proof that time flies! I enjoy your blog and love the Tool Time Tuesday posts! Thanks for the giveaway- like your tool time hints. I am fairly new your blog and I love it<3<3 Its lik having another best friend. WoW! A whole year has passed already! Lovly giveaway. I use to read you quite regularly so am glad I dropped by again. I became a follower so I wouldn't forget to come back! How fun! Thanks for the chance and happy TTT Anniversary! Congrats on your 1st anniversary! Great blog! Of course,I`m a follower and happy TTT anniversary!! Thanks so much for the chance to win and once again happy TTT anniversary!! What a great give away, thanks Sharonj. I am a follower too, thanks Sharonj. Wow - a year already - I've loved everything you've posted. This is just the icing on the cake. Hello, Karen........leaving comment number one! Leaving comment number two......I'd follow you anywhere!! I've gotten so many wonderful ideas from you this past year!! A year of TTTs, wow! How time flies and how we have loved your ideas. Thank you. how delightful! please count me in! of course I am a follower too sweet one! Awesome giveaway. Thanks for offering these things up!! I am a follower on Bloglines. OOOHHHH I love this. And I'm a follower. I'm going to comment away! Enough that I follow daily via Bloglines! And told my sister about you! I'm a follower (duh) and I just put something in the mail to you. Happy Tool Time Tuesday Anniversary Karen! I am certainly a follower! Love your tips! Wow you have a neat assortment of items. I love reading your Tool Time Tuesday posts. Please enter me to win your extra tools. What a fun - and very useful - giveaway! Somehow I missed the apron tutorial - love it! So, I can definitely put all that to good use! Hi, i'm a new follower. I've looked around your site and enjoy what I see. I did visit your blog before Christmas,even though I have become a follower today, and the idea for displaying Christmas cards. I'm also sharing your give away info on my website and facebook site www.bestquiltandsew.com. I love new ideas! I also am a follower. Thanks for such an inventive set of tool time blogs. I also follow you using Google Reader. I am now a follower, and would love to be involved in your great giveaway. Love your blog and all your interesting tips and tricks - thanks for a great giveaway! I also follow your blog via Bloglines. Thanks! New to your blog....but I am now a follower! I am also a Happy Follower!Keep up the good work! I am fairly new to your blog and am glad to have the chance to tell you how much I enjoy it. Keep up the good work. I love following your blog. Look forward to each TTT. Am anxious to see what you plan for those buttons you mentioned the other week. Thank you. I just became a follower how exciting! I love everything you have posted. Thanks for all the ideas. Thanks for everything. I came across this site while surfing one night and I look almost daily because its sooooo much fun. Thanks for sharing with us. I just emailed your site to my best friend Lynette, she's not only my best friend but my step Mom. She is super thrfty and would enjoys learning new things like you post on your site. Thank you for everything you do to teach us new things. I love tools. It is so much fun to find alternate uses for things. I am really loving blogs. I love your sewing room. I am a big fan of black. Thanks for blogging! ...and now a second chance as I just became a follower officially! I love visiting your blog and seeing what you have been up to. Love tool-time and all your handy hints. Thanks for a chance to enter your giveaway. I have a post about you on my blog, http://quilterinthepines.blogspot.com/ . After some trouble with my blog yesterday, all is well now. I enjoy all the tips, and have tried a few. Congratulations on a year. Your ideas are always bright, I really love reading them very week. Please keep going to the hardware store!!!! I will be coming back, promise. I'm also a follower...TTT are the way I found you and the reason I started following! 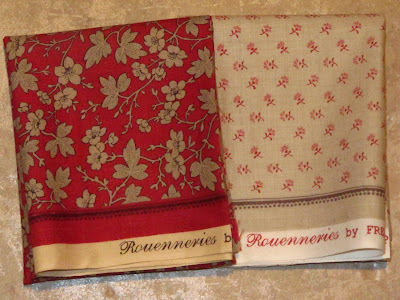 I`m following you since the minute I discovered your blog...and this rouennerie fabric, sight I hope I`ll winn! I would love to win your giveaway! Love your tips and thanks for sharing them with all of us. I have followed your blog on my reader since I found it, but I am now a follower also! Thanks! Love your blog and tips. Would be excited to win the give-a-way. This is my second entry as I am a follower of your blog. Thanks for donating the wonderful items. I may be late entering but I'm here catching up on friends. Hi Karen, thank you for offering such a fun, fun giveaway. This is totally a "Tool Time" giveaway. FOLLOWER ? Yes, I wouldn't miss your posts !! You have given me too many fun, wonderful ideas !!! I'm here one more time to let you know that I just added your fun giveaway on my blog's sidebar so each time someone opens my blog up, they immediately see info about your giveaway. Hope your Tuesday is going well, Karen. Enjoy...and thanks. I'm jumping in for a chance. Love your blog. I check in every Tuesday....okay more than just Tuesday, but you get the idea. Thanks! What a generous give away - count me in! good luck to everyone - goodness there are sew many of us!